Greenline Yachts, the Slovenia builder that’s at the forefront of the electric- and hybrid- power revolution, is launching a new Greenline 48 Coupe at the Düsseldorf show in January; it will be introduced to the U.S. at the Miami show in February. The 48 Coupe is modeled after the company’s 48 Flybridge model, and comes after customers said they wanted a large coupe-style boat. Because of its coupe configuration, the new 48 has an array of 2.4kW solar panels on its cabintop, providing the equivalent power of a small generator running all the time. The solar panels provide enough power to run all the onboard appliances, so that cruising, whether underway or at anchor, is quiet, without any smoke or fumes, and without any reliance on fossil fuels. Greenline is a pioneer in hybrid propulsion. The 48 Coupe is available with two 14kW electric engines and two 10kW generators. They can be combined with twin Volvo D3 220-hp diesels with straight shaft drives. 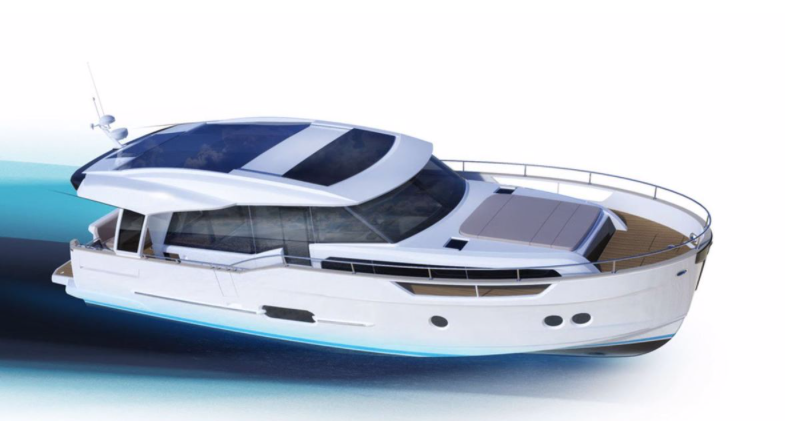 Under electric power, the boat cruises at 6.5 knots, with a range of 20 nm. Under hybrid power, with the 220-hp Volvos, it tops out at 15 knots. Other diesel engines are available, up to twin 480-hp Cummins, which will top out at 30 knots. Whatever power is used, the new Greenline has a package including a 600 Ah service battery, a 3kW inverter and the solar roof. The boat also has all the comforts of home, including a standard-size fridge with freezer, an induction stove and a microwave. There’s also a wet bar and barbeque in the cockpit. The cockpit and salon are all on the same level. The galley is aft in the salon so it can easily serve the cockpit as well as the salon. A U-shaped dining area with a lounge creates a large social space in the salon. A door next to the helm opens to the starboard side deck to make docking and line handling easy. Four steps down from the salon, the accommodations deck has three cabins and three heads. The master, forward, has either a queen-sized island berth or twin scissor-style berths. The shower compartment is separate from the en suite head. The other two cabins have twin berths. Specs. : LOA: 49’1”; Beam: 15’7”; Draft: NA; Disp. (dry): 29,320 lbs. ; Fuel: NA; Water: NA; Power: 2×220-hp diesel.